I had been an ebay shopper since year 2010. Although I don't shop periodically, I can attest trusted transactions with several online sellers and I strongly recommend buying online for your own convenience. 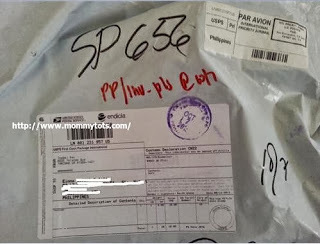 Last month, I ordered "Darth Maul Kid's Costume" for my son and received a notice of Parcel the other day. 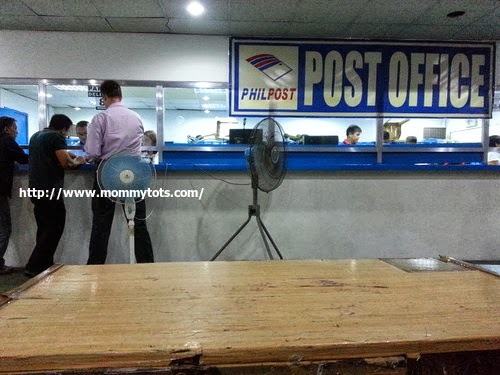 Since I came from my night shift duty at work, my husband met me at the Station and we went early at Alabang Post Office to pick-up my item. 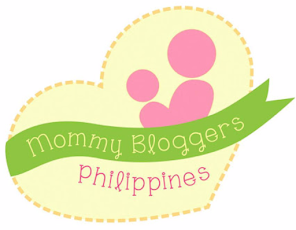 The amount to be paid for Postage Fee increased from 40 to 50 pesos~ well, not that bad! of released. But guess what? It took us 1 and a half hour to get the item! Why? 1st, they ask me to wait for the Custom Representative which is unusual, because they usually contact her through phone and declare what the item is, then it should be released right after. I was told that she's already at the parking area. So, we've waited... and waited. They already opened this package right in front of me, but still we have to wait for the Customs Representative. After their arrival, I had to wait again until they are settled to do transactions. I wonder what they are doing, seeing them used their calculator while looking at my Paypal Invoice. After a while, they handed me this shocking computation of fees that I have to pay! 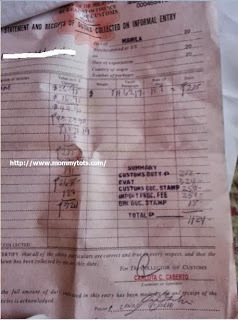 A whopping total of 1,124 pesos for Customs Duties and Tax! 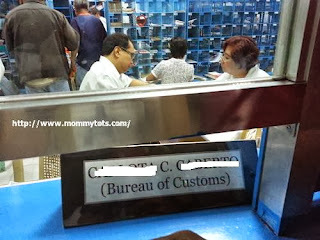 Sadly yes, Tax and Customs fees is about 50% worth of your package. As an online shopper, this is the first time I am asked to shell out for Customs Fees. I was surprised for the amount that I have to pay in order to get my item. Seriously? They were charging me 1,124 pesos for a halloween costume?! As I started to complain, they hand me this Primer on FAQs on Tariff and Customs Code of the Philippines. 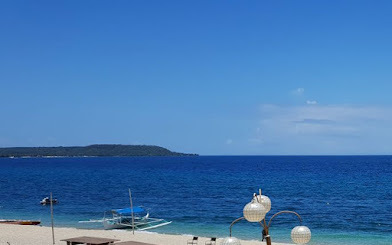 I asked when did they started collecting fees for items bought online, and the 'Customs lady' answered: "Matagal na po, pinagbigyan lang kayo dati". And I answered back, "Ito na ba talaga amount, hindi na mababago?". Her reply makes me laugh as she says: "Marami na po ang nawala sa Gobyerno". As she's trying to imply, "Magbayad ka naman". Hahaha.... Wasn't it the other way around? As I got more irritated, husband gives me the money and says "Magbayad ka na, walang mangyayari sa pakikipag-usap mo dyan". And, he's right... it's just a waste of time talking and complaining about the matter. If I don't want to pay, then I could just leave and let them have my item. So, would I let them keep my stuff? With a heavy heart, I paid and not let them keep the item for their 'own use' (I guess?). If only may fixer din at that time, grab ko na. Tsk, tsk! Got SCAMMED by our own Government. I experienced the same thing as you. I paid them the tax with a heavy heart. It's more corrupt in the Philippines. Lesson learned next time we don't send the items with this couriers anymore. The effective % rate of customs and duties you paid over the purchase price is large because the monetary amount of the item is relatively small. When you buy in larger monetary amounts, the effective % rate of duties will also decline. I also found out the hard way when I bought a spare WiFi internal adapter for my laptop.